This is a complicated beer. It's not like any dark lager I've had before. In fact I'd almost compare its flavor profile to a cola. It's like a beer soda! And I know, I know, that sounds totally nasty. Right now some of you have just had terrible flashbacks involving VitaMalt, but just go with me on this one. Pricey, but worth the splurge, at about $2.5 a can. I've yet to try a Lagunitas beer I don't like, but this one is particularly satisfying. (Just for the name alone, five stars.) A sturdy winter beer that I think would pair well with chili or some sort of meaty stew. Think toasty caramel and crème brûlée. 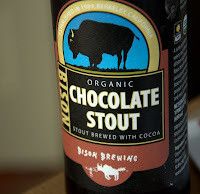 Bison Brewing in Berkeley makes some pretty darn tasty -- and organic -- beer. Nice hints of ginger and cinnamon spice. Not a “flavored” beer by any means. Picks up where fall pumpkin beer leaves off. The Chocolate stout is amazing. In fact, in a blind tasting, I'll bet you could mistake it for a Young's Double Chocolate stout. I mean, if you hadn't had one in a while. And don't forget that Friday is the start of SF Beer Week (Feb. 5-14). For a full list of events in the Bay Area check out their website! Sazeracs of course. And to eat, boneless chicken wings, homemade pretzels, and beignets. Keep a lookout for that special email.